Under Cabinet Lighting is a growing trend in the use of LED Strip Lights. Use LED Ribbon to light under your cabinets, above cabinet lighting, and even for toe kick lighting. The thin profile of LED Strip Lights make them perfect for lighting your kitchen cabinets because they are so versatile in the space that they fit in. 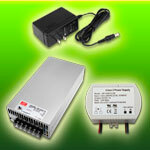 The low power consumption makes for a long lasting and energy efficient kitchen, bar, home, or business lighting. Use our outdoor waterproof LED Strips for outdoor cabinets or to guard against dust and moisture indoors. Our most popular Under Cabinet LED Strip Lights are our Bright White and Warm White LED Ribbon. 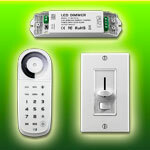 Available in 5 different brightness levels for indoor and dry Cabinet Lighting. Our waterproof Bright White and Warm White LED Strip Lights are perfect for under cabinet LED Lighting. 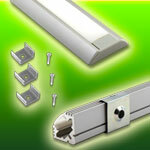 Available in 4 different brightness levels for indoor or outdoor cabinet lighting applications. For those looking for colored cabinet lighting we have Red, Green, Blue, and Amber Single Color LED Strip Lights for Indoor under cabinet lighting that is a bit more vibrant and vivid than our standard white and warm white cabinet lighting. We also have our Red, Green, Blue and Amber single color LED Strip Lights available in a waterproof TPU housing. Great for outdoor cabinets or cabinet lighting that can easily be wiped off or guarded from dust, spills and moisture. For those looking for a color changing option for their under cabinet lighting, we have plenty of RGB Color Changing LED Strip Lights for under cabinet, over cabinet, or toe kick LED Lighting. Use with a basic RGB Controller or DMX Control for 16 million possible color tones. If you need a waterproof option for your under cabinet lighting, we have plenty of Waterproof RGB Color Changing LED Strip Lights for under cabinet, over cabinet, or toe kick LED Lighting. Use outdoors, in moist locations, or indoors to make your LED Strip light guarded from spills and moisture.